Surf Sri Lanka - Where should I go? When should I go? What's best? Home / Surfing / Surfing in Sri Lanka – when, where, and how. Sri Lanka is an amazing country to visit for a surf trip. It is blessed with waves all year round, and has a good selection of point breaks and beachies. There are loads of beginner spots, as well as plenty of options for more experienced surf travelers. When is the surf best in Sri Lanka? Sri Lanka has two distinct surf seasons. From November to April prevailing Easterly winds make for great offshore conditions on the Western and Southern side of the island. Famous spots like Hikkadua (an hour and a half south of Colombo) really fire during this time. Between May and October the weather patterns reverse, and the Eastern side of the island becomes the surfing mecca. It can take a little bit of time for the sand to push into all of the points on the East coast, so after June is when the spots start really working well. Where is the surf best in Sri Lanka? The West coast is dotted with surf spots. Hikkadua is the most famous surf town, but there are plenty of other less known beaches just North and further South from there. Heading further South, Galle has a few waves for beginners, and Mirissa / Weligama are also great for learning. Dotted between these towns are plenty of spots for more experienced surfers. The Western corner of Mirissa can turn on in the right conditions, and Unwatuna can also get quite big. The further past Mirissa you go, the less crowded it gets. The coast past Matara is relatively unexplored (and turns into Yala National Park after some distance), but is also known to work well. Try and make flexible travel arrangements so you can move around depending on what is working. Arugam Bay (Arugambay / A Bay) is the most famous break on the East coast, and it certainly deserves this reputation. The wave is a right-hand point break, and offers up to 300m long rides. It usually breaks in the 1-3ft range, but can get up to a solid 6ft with the right swell. It can get crowded, but it offers a generous take off area, so it’s not super competitive. 30 minutes North of A Bay is Whiskey point. This is generally smaller than A Bay, but can also be less crowded. The takeoff spot is tighter than A Bay and it requires quite a lot of sand to move up the coast before it starts working properly. When it’s working, however, it does amazing things. 30 minutes South of A Bay is Peanut Farm. This spot offers a beach break and inner right hand sand bottom break for beginners. Further out is a much longer right hander for the more experienced. Sri Lanka is serviced reasonably well by buses and trains, but travelling with boards can be a hassle (you have to pay extra to get your board on the bus). Private drivers are a good option if you have cash to burn. They’ll take you anywhere you want to go, and the standard of cars / vans is generally pretty good. It will cost between US$50 and US$150 per day for a driver (depending on your negotiating skills, distance, and quality of car), and you might also have to pay for the drivers accomodation (US$10 per night). 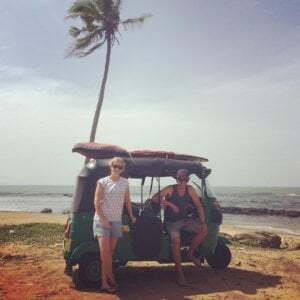 The best way to surf Sri Lanka, however, has got to be by self-driving your own tuktuk. Having your own wheels (or boat) is essential for any good surf trip, and Sri Lanka is no exception. Being able to get to the right spot before anyone else, and being able to move quickly when conditions change will help you score twice as many waves. Surfboards (of any length) can be strapped to the roof of tuktuks easily. Go to www.tuktukrental.com to book!